Frozen shoulder is a condition in which the shoulder is painful and loses motion because of inflammation. The capsule of the shoulder joint has ligaments that hold the shoulder bones to each other. 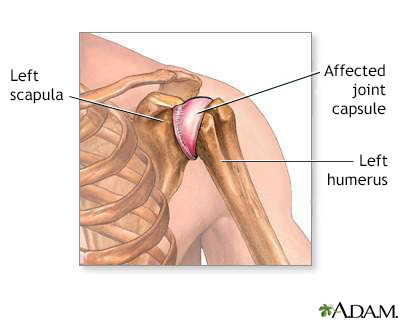 When the capsule becomes inflamed, the shoulder bones are unable to move freely in the joint. Frozen shoulder without any known cause starts with pain. This pain prevents you from moving your arm. This lack of movement can lead to stiffness and even less motion. Over time, you are not able to do movements such as reaching over your head or behind you. Your health care provider will ask about your symptoms and examine your shoulder. A diagnosis is often made when you are not able to rotate your shoulder. You may have x-rays of the shoulder. This is to make sure there is no other problem, such as arthritis or calcium deposits. Sometimes, an MRI exam shows inflammation, but these types of imaging tests are usually not needed to diagnose frozen shoulder. Pain is treated with NSAIDs and steroid injections. Steroid injections and physical therapy can improve your motion. It can take a few weeks to see progress. It may take as long as 9 months to a year for complete recovery. Physical therapy is intense and needs to be done every day. Left untreated, the condition often gets better by itself within 2 years with little loss of motion. Risk factors for frozen shoulder, such as menopause, diabetes or thyroid problems, should also be treated. Surgery is recommended if nonsurgical treatment is not effective. This procedure (shoulder arthroscopy) is done under anesthesia. During surgery the scar tissue is released (cut) by bringing the shoulder through a full range of motion. Arthroscopic surgery can also be used to cut the tight ligaments and remove the scar tissue from the shoulder. After surgery, you may receive pain blocks (shots) so you can do physical therapy. Follow instructions on caring for your shoulder at home. Treatment with physical therapy and NSAIDs often restores motion and function of the shoulder within a year. Even untreated, the shoulder may get better by itself in 2 years. After surgery restores motion, you must continue physical therapy for several weeks or months. This is to prevent the frozen shoulder from returning. If you do not keep up with physical therapy, the frozen shoulder may come back. If you have shoulder pain and stiffness and think you have a frozen shoulder, contact your provider for referral and treatment. Early treatment may help prevent stiffness. Call your provider if you develop shoulder pain that limits your range of motion for an extended period. People who have diabetes or thyroid problems will be less likely to get frozen shoulder if they keep their condition under control. American Academy of Orthopaedic Surgeons website. Frozen shoulder. orthoinfo.aaos.org/en/diseases--conditions/frozen-shoulder. Updated March 2018. Accessed December 10, 2018. Finnoff JT. Upper limb pain and dysfunction. In: Cifu DX, ed. Braddom's Physical Medicine and Rehabilitation. 5th ed. Philadelphia, PA: Elsevier; 2016:chap 35. Harris JD, Griesser MJ, Jones GL. Stiff shoulder. In: Miller MD, Thompson SR, eds. DeLee and Drez's Orthopaedic Sports Medicine: Principles and Practice. 4th ed. Philadelphia, PA: Elsevier Saunders; 2015:chap 55. Miller RH, Azar FM, Throckmorton TW. Shoulder and elbow injuries. In: Azar FM, Beaty JH, Canale ST, eds. Campbell's Operative Orthopaedics. 13th ed. Philadelphia, PA: Elsevier; 2017:chap 46. An inflammation of the shoulder joint can cause pain and restricted joint movement.